I have been wanting to make JB some Waffles for sometime. I was fortunate enough to get a couple made before my waffle iron died. So then I switch gears and made some pancakes out of the rest of the batter. I learned a couple of things out of this experience. The batter works for either waffles or pancakes.They both taste delicious, and I need a new waffle iron. Stir together all the wet ingredients. Combine wet ingredients into the dry ingredients and stir until well combined. There will be some clumps. Notes: Let your batter set for 30+ minutes. this step is important when you use gluten-free flour. Another important factor to remember is that these waffles take longer than what your waffle iron will dictate. They take about 5-6 minutes. Keep this in mind, and look for a golden brown color. Trust me on this, and learn from my mistake. Make sure you spray your waffle iron. You do not want your waffles to stick to the iron. Spoon batter into the waffle iron. Watch for that golden color. Top with your favorite condiments. Here is another breakfast option, other than oatmeal. I made a batch of these, and then froze the remaining waffles for another time. 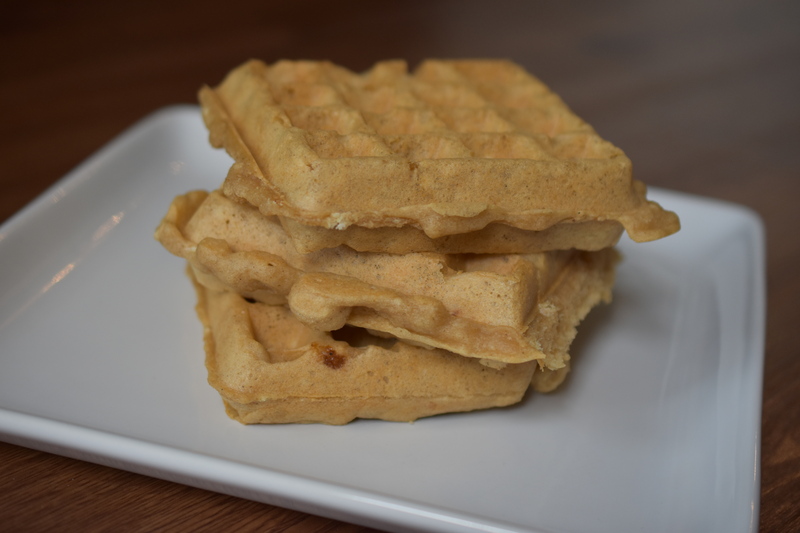 Instead of buying those pre-made, who knows how to pronounce all the names kind of waffles, you can make your own in batches and have them anytime you desire a good Belgian waffle. This recipe makes about 6 waffles.